4 of us made it to the LCCC hut in Tanygrisiau (but only 3 sleeping bags – Doh) for an off-calendar YAC trip. I travelled over with Mike Shaw, and Luke came from the dark side and Peri made her way in her van and met us there (eventually). Forecast was pretty good according to "the lying norwegian bastards" on Peri's phone, they predicted some sun, no rain and lots of wind which is what we got. Mike and I headed to Flake Wall a great HVS with really only 1 tricky bit stepping off the pinnacle. We then headed to C-y-Oen and Mike led Pinky VS 4c ** before changing to our 3rd crag (C-y Wrysgan) where we did White Slab and Honeysuckle Corner HS 4a,4b ** really good varied climbing worth doing. Peri and Luke had tackled Brys (HVS 5a) and Ushers Dilemma at Clippeau and we all met back at the hut for 6ish, rain started later and kept up till dawn. Sunday we all headed back upto Wrysgan (via the mines) to do the bold Y Gelynen VD **, reports of 4, 6 placements in 40m seemed a bit odd to me as I got 11 runners in on P1, still manages to feel bold though. We then looked at the VS which was overgrown with grass before heading along to do Slack (S) with Mike getting the bold arete. 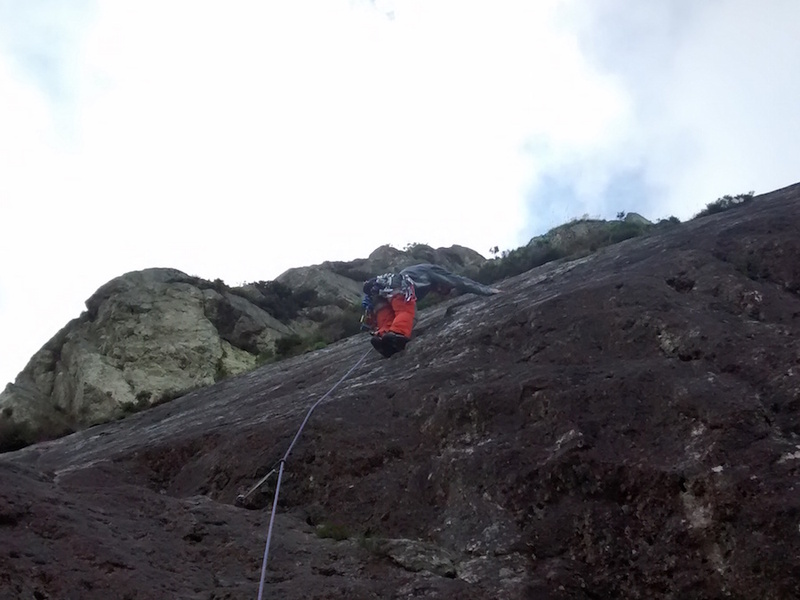 Luke and Peri repeated our route of yesterday finding the slab quite bold and the corner very wet ! I think we had the best of it. They then spent some time exploring the old workings. After tea and cake we were on the road for 6. Great but basic hut (despite Peri's observation "it's a dump") which is often free, trivial to book and away from it all. There is more climbing to be had, especially if you have the definitive guide not the selectives, and other crags are close by. You are currently browsing the York Alpine Club Blog blog archives for July, 2015.